The 2017 Lingenfelter Signature Edition Corvette Z06 that co-stars in the grand-prize package for the 2017 Corvette Dream Giveaway will be on display in the Lingenfelter Booth at the 2017 SEMA Show on October 31st through November 3rd. Come hang out in booth #25075 in the Central Hall where you can get up close and personal with this unprecedented Corvette that bears Serial #001. The 2017 Lingenfelter Signature Edition Corvette Z06 Coupe cranks out 800 horsepower thanks to a 376 cubic inch (6.2 liter) Chevy LT4 Gen 5 small-block featuring a Magnuson TVS2300 Heartbeat Supercharger System (engineered for the seventh-generation Corvette Z06), ported and polished factory cylinder heads, an ultra-high-performance GT3 cam, and Royal Purple motor oil, all courtesy of the horsepower experts at Lingenfelter Performance Engineering. This Corvette show car comes finished in Torch Red with a 3LZ interior, which features Jet Black perforated Napa leather seating surfaces and a unique, serialized dash plaque. The exterior also features unique styling and badging. It is loaded with high-performance factory options, including the Z07 performance package (Track Package), carbon fiber visible package, 8-speed paddle-shift automatic transmission, competition sport seats, and Z06 black aluminum wheels. The 2017 Corvette Dream Giveaway is a nationwide drawing sponsored by New Beginning Children’s Homes-a charitable organization. 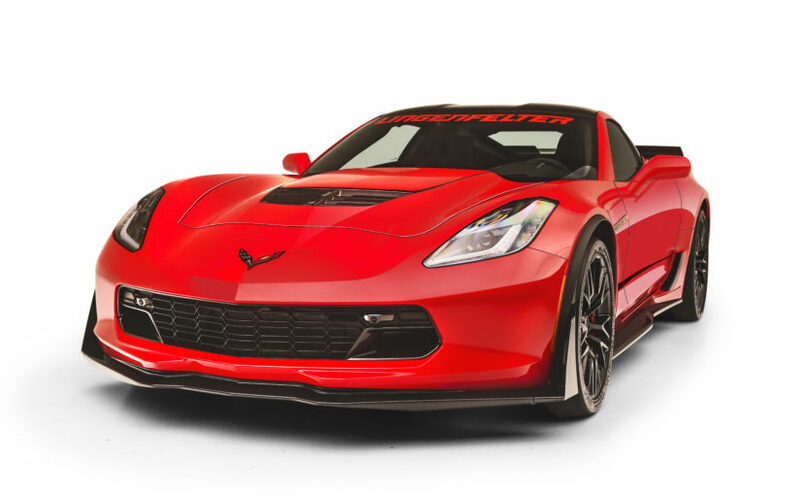 The winner of this extraordinary prize package will receive the supercharged 800hp 2017 Lingenfelter Signature Edition Corvette Z06 and a 1963 Split Window Sting Ray. Also included in this grand prize package is $50,000 cash for taxes. To enter the giveaway by receiving one complimentary entry from Lingenfelter Performance Engineering, text “LPE” to 31996 from your smart phone or stop by the Lingenfelter Performance Engineering booth (#25075) and Royal Purple booth (#23543). In addition, the general public can enter with donations by calling call toll-free (877) 700-8946 or online at http://www.dreamgiveaway.com. You can use promo code LE1017C3 to get 75% bonus tickets with any donation of $25 or more. Don’t forget to stop by the Lingenfelter booth (#25075) at the 2017 SEMA Show and see this Corvette show car in person and visit the Royal Purple booth (#23543), the official motor oil of Lingenfelter Performance Engineering. 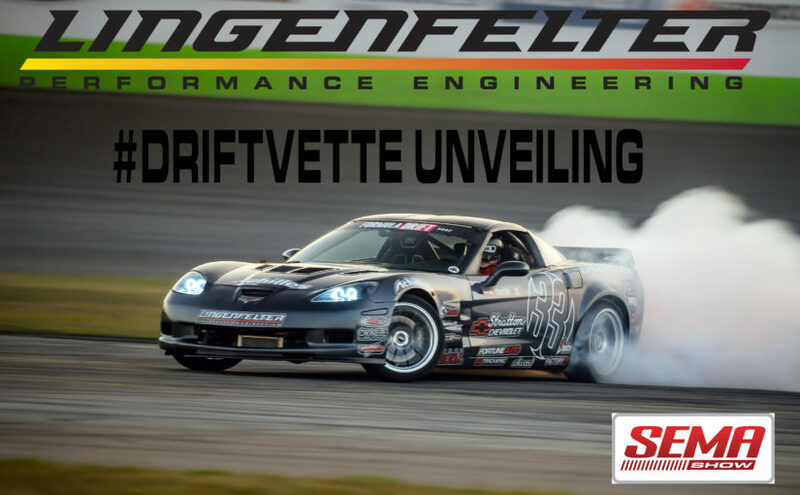 Lingenfelter Performance Engineering will feature sponsored Drift Driver Dirk Stratton at SEMA this year! Many of you have already been following the #DRIFTVETTE #33 this year, but we have a special surprise in store for you! For the 2018 Drift Season, the #DRIFTVETTE will feature an all NEW look! If you are not attending SEMA, be sure to follow along at www.driftvette.com for live updates! 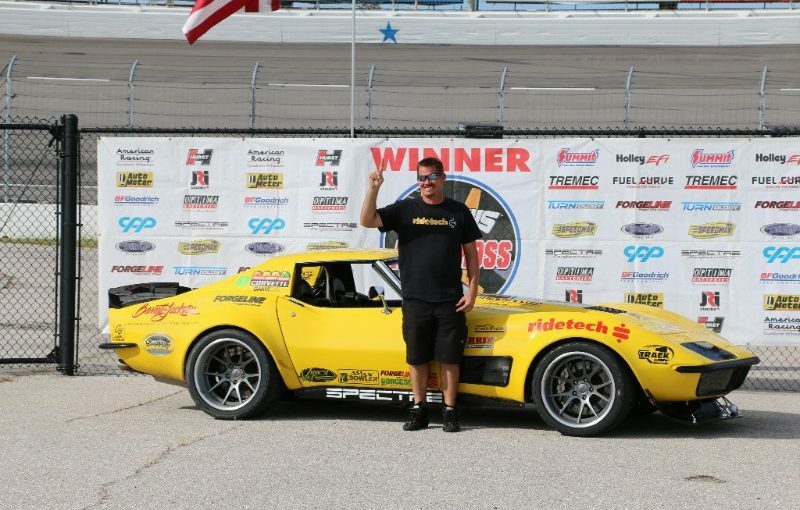 Chris Smith driving the RideTech 48 Hour Corvette, Lingenfelter Powered has clinched the Goodguys Autocross National Championship. Chris and our (Ridetech) Corvette have placed 1st or 2nd in every Goodguys Autocross attended in 2017. Smitty has been driving the 48 Hour Corvette since 2015 and is one of the driving forces behind the RideTech Motorsports Track 1 program that provides custom-tailored parts and solutions for pro-touring enthusiasts. This Goodguys Autocross Series Championship caps off a very successful three year program that will culminate with the 48 Hour Corvette being sold at No Reserve to the highest bidder at the Barrett-Jackson auction in Scottsdale, Ariz. in January 2018. If you want a Championship-caliber Pro-Touring Corvette, register to bid. Also in 2018, Smitty will be driving the all new RideTech Track 1 1970 Camaro. Lingenfelter Performance Engineering & RideTech would like to thank Goodguys and its many exceptional sponsors for producing such an exciting and ultra-competitive Autocross series.